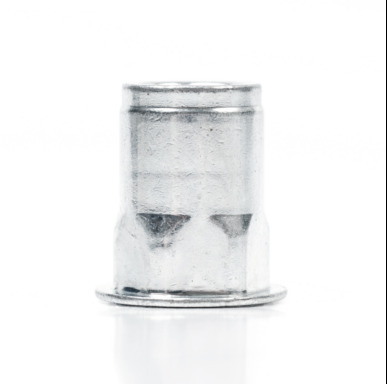 Marson® Klik Thread-Serts are a versatile threaded fastener that can be used in a variety of applications. Use Klik Thread-Serts in any thickness of metal or rigid material of at least 3/32 " (.0937 ). Eliminate the need for tapping, welding and brazing. Marson® Klik Thread-Serts' design consists of an upper sleeve and a base which has both internal and external threads. During installation the base is drawn upwards inside the upper sleeve forcing a 360° contact between the sleeve and application material. No special preparation is needed; a drilled or punched hole is all that is required. Because of its unique setting ability, Marson® Klik Thread-Serts can be used in almost any thickness of material. Installation is made easy with a variety of tools and kits.